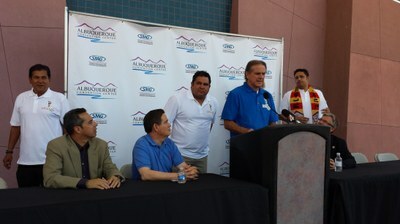 Representative Antonio Maestas, City Council President Ken Sanchez, Economic Development Director Gary Oppedahl, & Larry Espinoza and Ron Patel of Albuquerque Sol, welcomed two World Cup legends to Albuquerque. Carlos Valderrama, a former Colombian soccer sensation, and former Coach Bracamontes of the Chivas came to announce an International Legends Cup to be hosted in Albuquerque on September 13, 2014. “We welcome these legendary players to our city for this friendly soccer match and hope to see the support of the community of Albuquerque, the state of New Mexico and soccer fans from all over,” said Councilor Sanchez.